Sometimes I just need to find a good excuse to brave the freezing weather and get everyone outside. 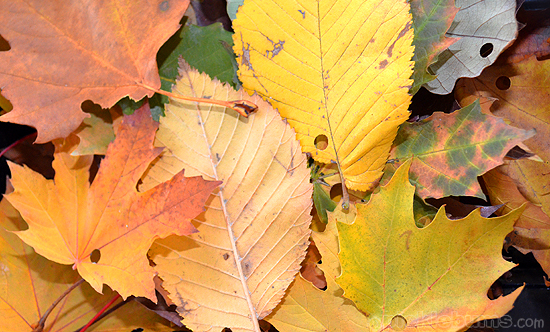 On the weekend that reason was autumn leaves… we needed to collect autumn leaves. I wasn’t exactly sure why we needed autumn leaves, it just seemed like an important thing to do before they all fell from the trees and turned into a slippery mushy brown mess on the ground. After putting fifty-gazillion layers of clothes on all the kids, and only ten-gazillion on myself (which really was an over-site) and attempting to bribe Noey with chocolate chips to keep his hat on (which didn’t work once the chocolate was gone… duh!) we headed into town to the park. The kids raced around collecting leaves, watched the cockies tear up the pine cones and drop bits on our heads, and had a quick play on the equipment. Once my fingers were blue and the toddlers snot had frozen to his face (it was cold ok) we piled back into the Big White Bus and came home… with a HUGE bag of autumn leaves. Um…. er…. um…. then inspiration struck and I went to find the hole punch. Two days, lots of searching, and finally a trip to the shops later, with a brand new hole punch in hand Morgan set about punching holes in some of the Autumn leaves. We were going to thread them! 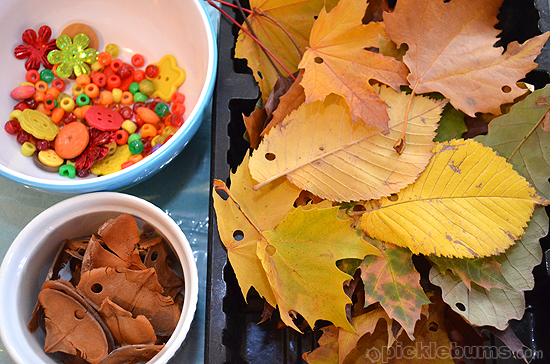 As Morgan worked on his fine motor and problem solving skills with the leaves and hole punch, I dug around in the cupboard for some beads, buttons and other thread-able items in ‘autumn colours’. We also discovered we could punch holes in the bits the cockies had stripped off the pine cones too, bonus! Armed with some plastic threading ‘strings’ (The plastic ‘strings’ are stiffer and make it easier for little fingers to thread. 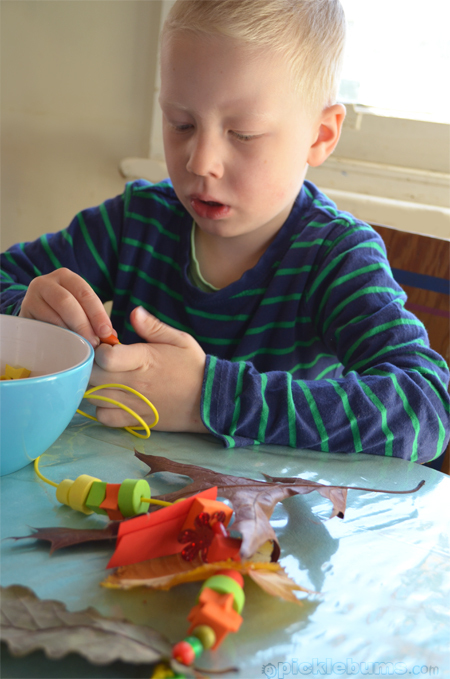 You can buy packets of plastic string at craft shops or you can buy a roll of cheap whipper-snipper cord at the two dollar shop which is just as good) Morgan, and Noah (with a lot of help from me) had a lovely time making autumn leaf threadings. 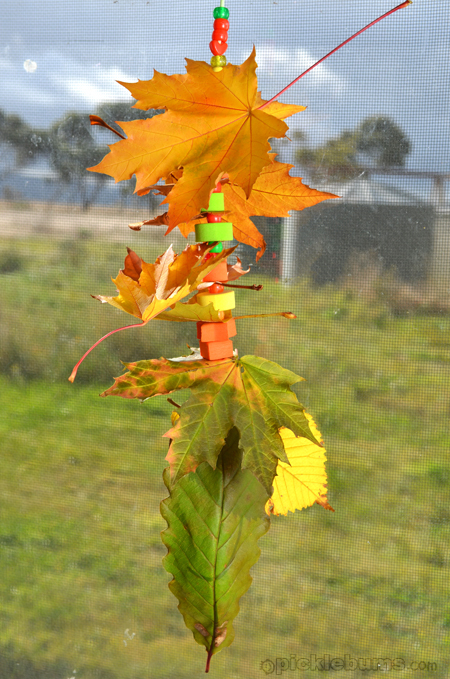 Now what to do with the rest of the autumn leaves? 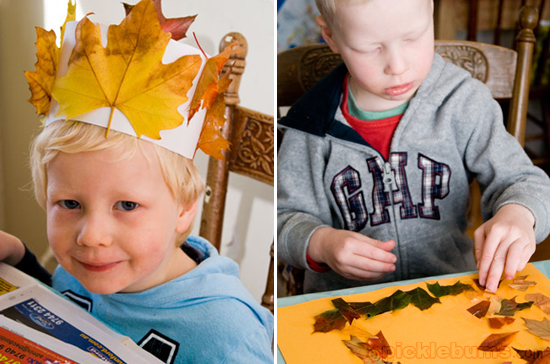 Autumn crowns and autumn leaf collage. Fantastic! We’ve been trying to spend as much time as possible outside in the sun, now the kids can collect leaves rather than my roses! You’ve got so many great ideas that don’t cost a bundle and I wish I could remember at least one when I needed to. I wondered if you could put them onto a single page? 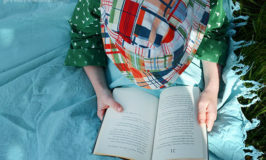 Somewhat like Childhood 101 did for holiday ideas – just a rolling script of ideas?? It would be great to have a preschool ‘quick ideas to beat the boredom meltdowns’ mini poster on the fridge. You know I’ve been thinking of creating an ebook about ‘easy art activities’… maybe a printable ‘go to list’ would be good to add to that? 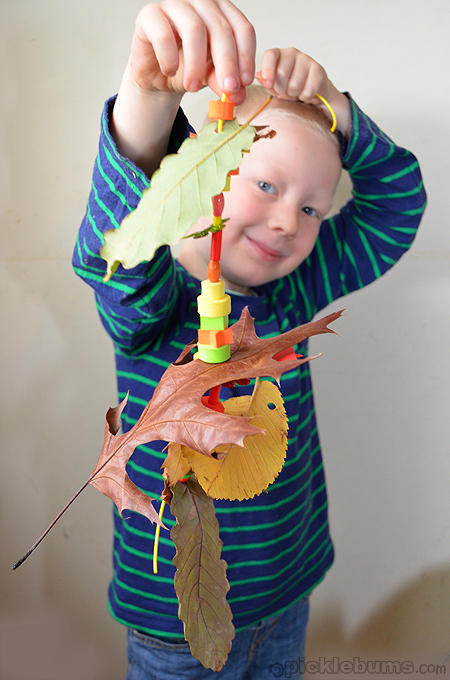 We have a project on the go using Autumn leaves too. It’s probably the most unique season of the year. You know I think this activity would work equally as well with regular leaves… probably better as gum leaves and the like would be stronger… and just think… I may have autumn leaves but I also have 2 degree mornings! Gorgeous idea Kate – pinned! Lovely idea Kate. I love autumn activities. Would you mind if I pinned this (and any other ideas from your site) to my boards on Pinterest? I really need to add a little button or notice to my side bar to say that don’t I…. How can you ensure it links back to the actual page Kate? It doesn’t give you any options when you post using the Pinterest pin. I think by default it should but then I know I’ve clicked via Pinterest onto some pins and it has only connected to the blog not the post itself. Unless it does that when you repin? Fabulous idea – as usual – Kate! Filing this one away. Fun way to play with the leaves! Thanks for sharing! Oh my goodness, I LOVE this!!! Now I know what we’re going to do with all the leaves I pressed last week. Thanks for the great idea.